Several months ago I received an email from an editor at Black Dog Publishing which operates out of London. Black Dog prints books on a variety of topics such as photography, architecture, film and design. They did a book on Independent record shops that I am dying to own. One of the publisher’s upcoming projects is a book on German rock, experimental and electronic music, and the 1960s counterculture. 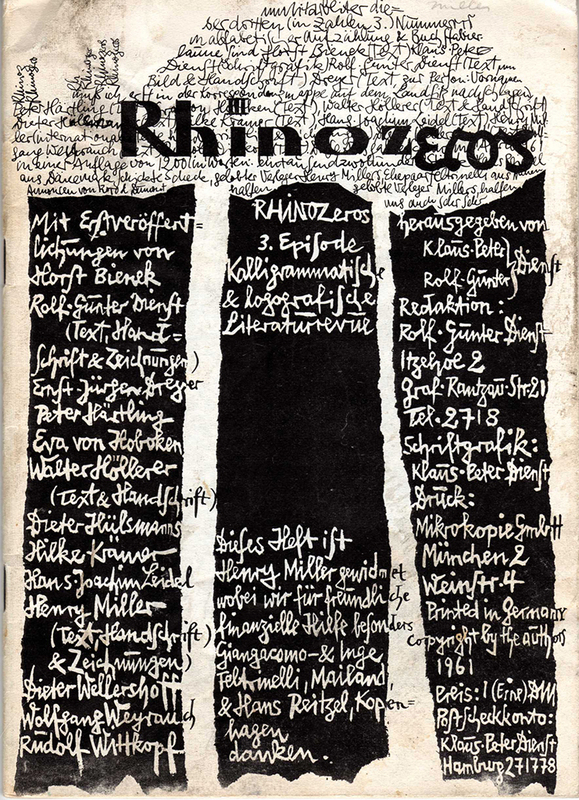 The editor contacted me for some images of Rhinozeros, a German little magazine published out of Hamburg, edited by brothers Rolf-Gunther and Klaus-Peter Dienst from 1960-1965. 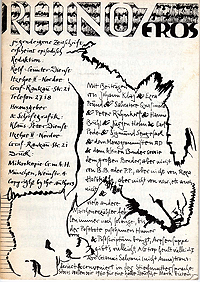 Klaus-Peter provided the iconic calligraphy. Burroughs appeared in four of the ten issues. I had Issues Five and Seven, which I purchased at the legendary Nelson Lyon Sale in 1999. I happily provided the images. The request got me obsessed with Rhinozeros. 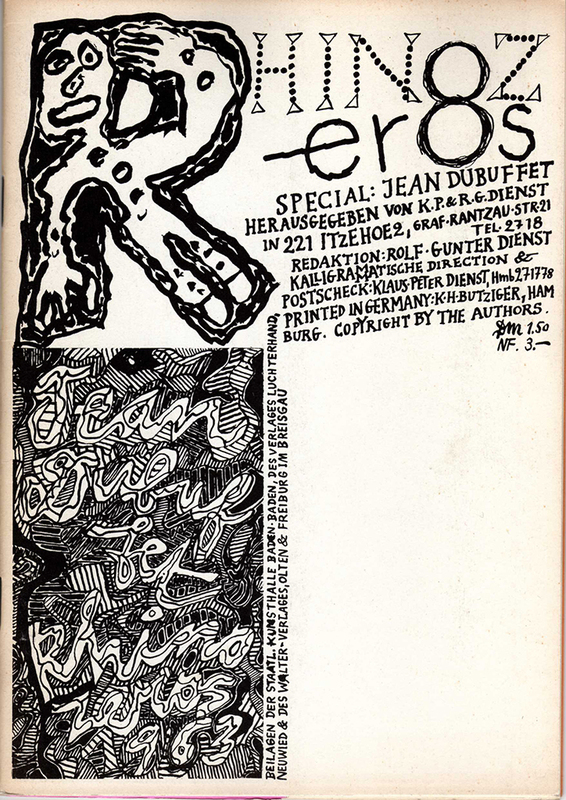 I have touched on this remarkable little magazine in a piece I wrote about Burroughs’ early 1960s mag appearances in Germany and Belgium. There is not a lot of information on Rhinozeros in English, and I do not have much to add to what I wrote in that piece, but I did start digging around the internet looking to piece together a complete run of this visually stunning publication. A bookseller in Switzerland had several issues and a click to Powell’s website filled in the holes. Now I have all ten issues. So here are the covers of all ten issues as well as scans of all the Burroughs appearances. 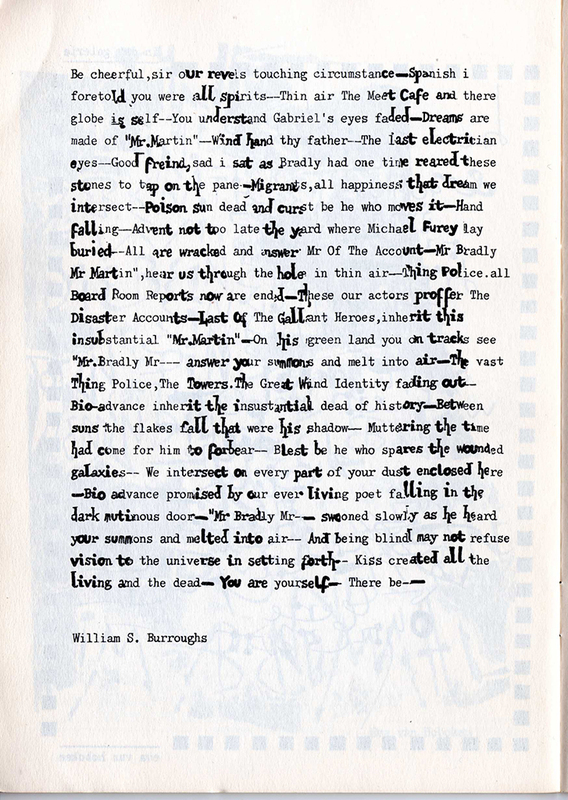 The images make clear that some of the most exciting visuals in all of Burroughs’ oeuvre in any format, be it novel, broadside, magazine or painting, reside within the pages of Rhinozeros. 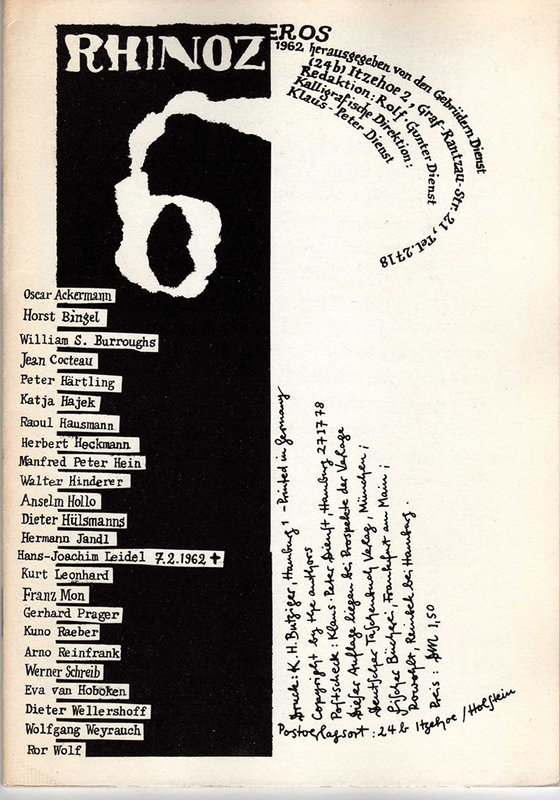 The Dienst brothers were interested in the Beat Generation, concrete poetry, and the cut-up technique. 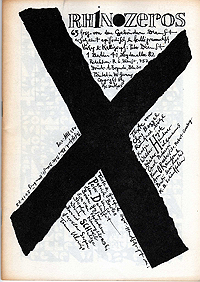 Klaus-Peter knew Brion Gysin and would have been aware of the cut-up soon after its rediscovery. 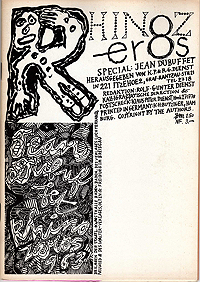 The Dienst brothers then discovered Burroughs through Gysin. In turn, Rhinozeros helped introduce the cut-up to a small German audience. 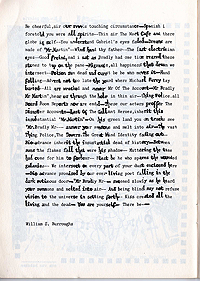 Not surprisingly, Burroughs was a major presence in the magazine, but his influence spread throughout Germany during a renaissance in that country’s poetry and literature of the 1960s. 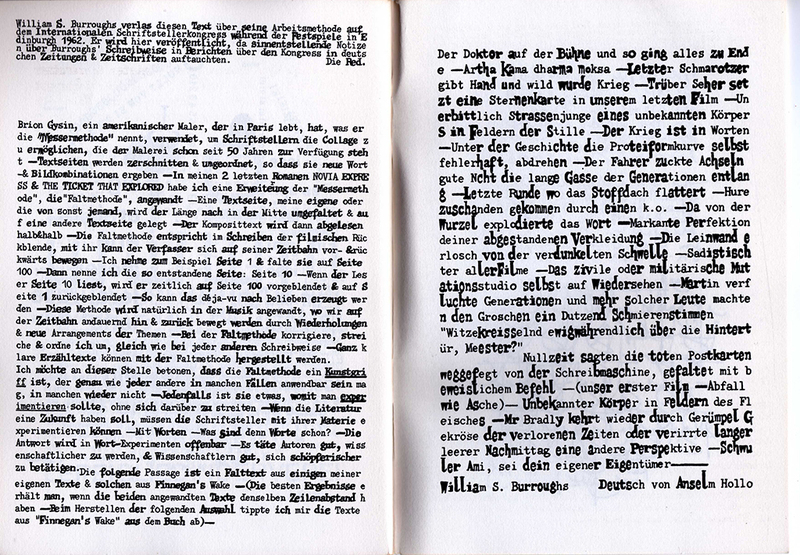 German writers like Carl Weissner, Rolf Dieter Brinkmann, and Jurgen Ploog took immediately to the work of Burroughs, particularly the cut-up. 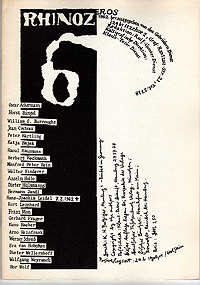 Issue Five usually gets singled out for special attention by American collectors. 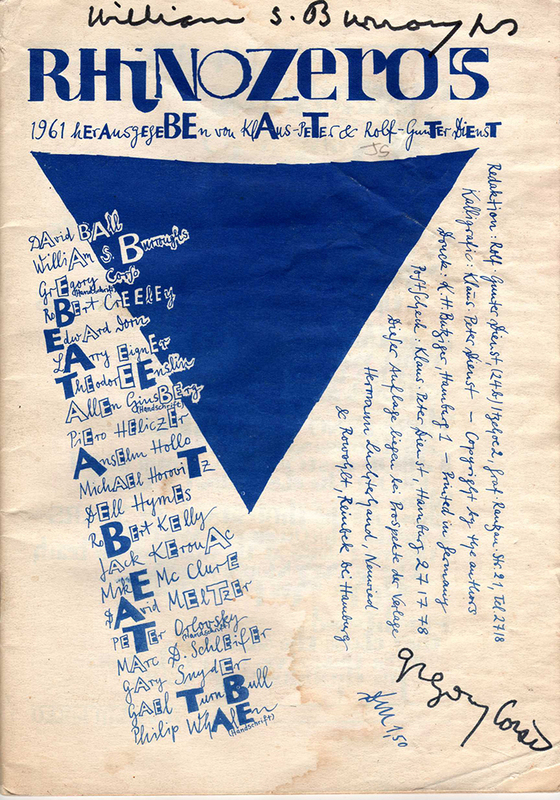 This is the Beat Issue and features Jack Kerouac, William Burroughs, Gregory Corso, Allen Ginsberg, Gary Snyder, Philip Whalen, Michael McClure and Peter Orlovsky in its pages. The issue is also the only one in color which makes for some remarkable visuals. Peter Ellis Booksellers, operating out of London, has a truly special copy of this issue for sale. Tipped in with the mag are four T.L.S. 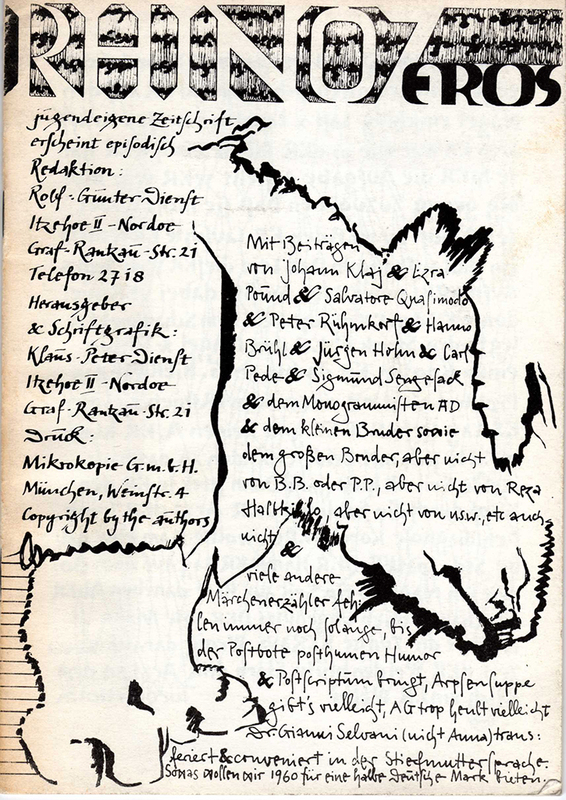 from Rolf-Dieter Dienst to Whalen and David Meltzer requesting material for his magazine and a projected anthology. 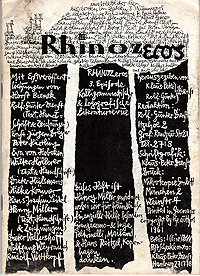 Whalen has doodled on one of the letters and has written: “How far off is our history” and “How far off our history is.” The letters makes this special issue of Rhinozeros even more so. My copy is signed by Burroughs and Gregory Corso. Interested parties might be aware of Burroughs’ importance in German literature of the 1960s, but Corso’s equally important role might be less well known. After a trip to Venice in the Summer of 1960, Corso arrived in Berlin in July of that year and stayed there for several months. In that time, Corso performed readings, wrote poetry, and met with poets and academics. 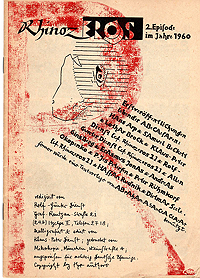 Two years earlier, Corso began work on a German anthology of Beat writers with Walter Hollerer, a professor out of Berlin. 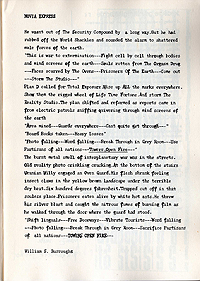 In letters from late summer / early fall 1960, Corso writes on the topic of Beat anthologies and he hoped his anthology would be published within the year. 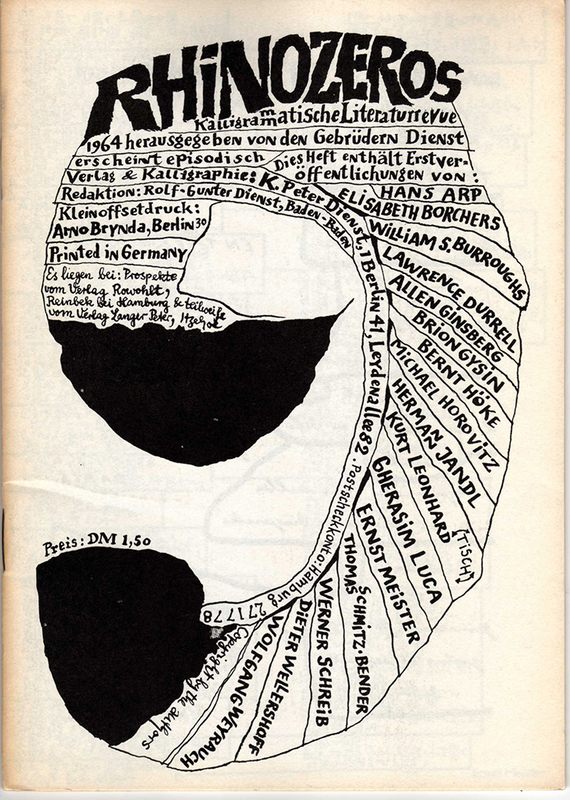 Junge Amerikanische Lyrik was eventually published in 1961, introducing the poets of Donald Allen’s New American Poetry anthology to Germany. So it could be argued that Corso was the face of the Beats for German poets at this time. 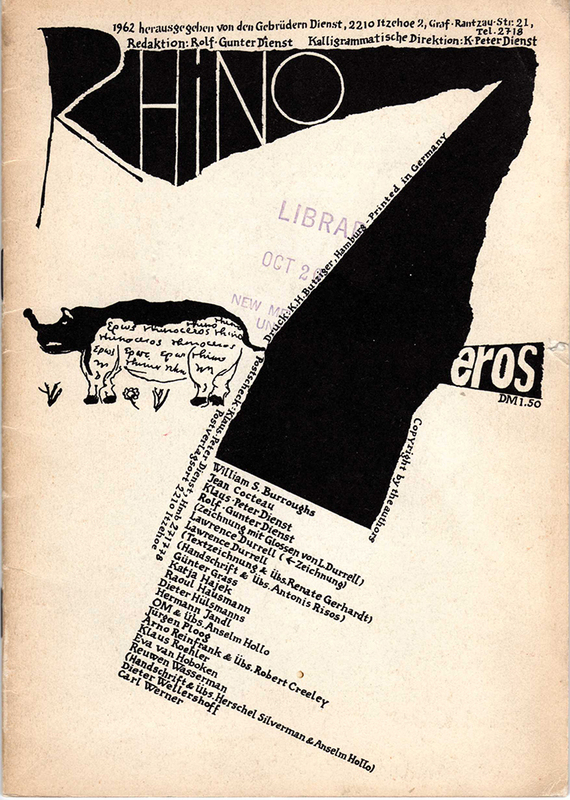 Not coincidentally, Rhinozeros was started in 1960, possibly around the time of Corso’s sojourn in Germany. 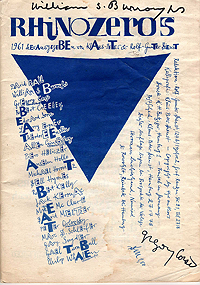 Without a doubt, Corso’s presence raised awareness of the Beats in Germany and helped spread the word about New America Poetry throughout the country. Written by Jed Birmingham and published by RealityStudio on 4 January 2009. Updated with scans of complete issues on 9 July 2012. Another wonderful article, Mr. Birmingham. Fascinating stuff, as is usual for your work. 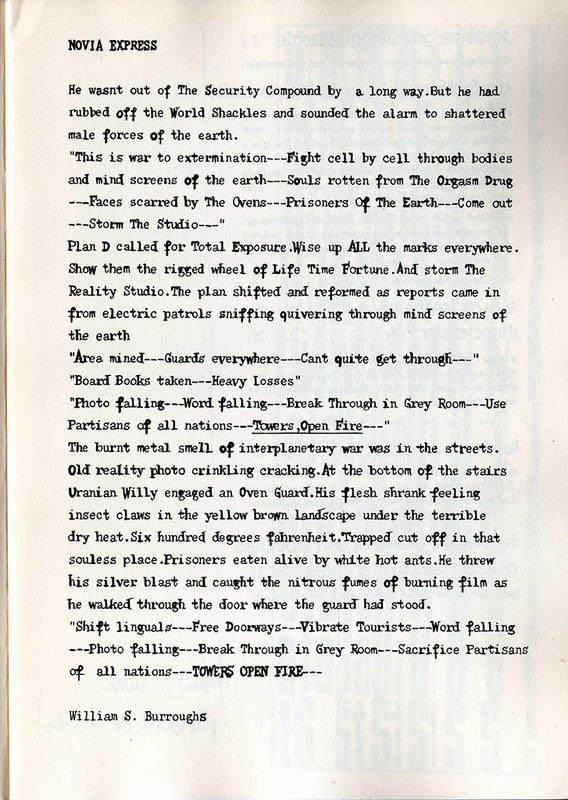 The reproductions of Mr. Burroughs’ pages are quite exciting! The details you provide, about Mr. Corso, are disintegrating my dislike for his personality and causing me to recognize his historical, literary significance. My project of using Mr. Corso’s portrait, for my poster promoting retroactive abortion, is hereby rescinded. RIP, Greg. 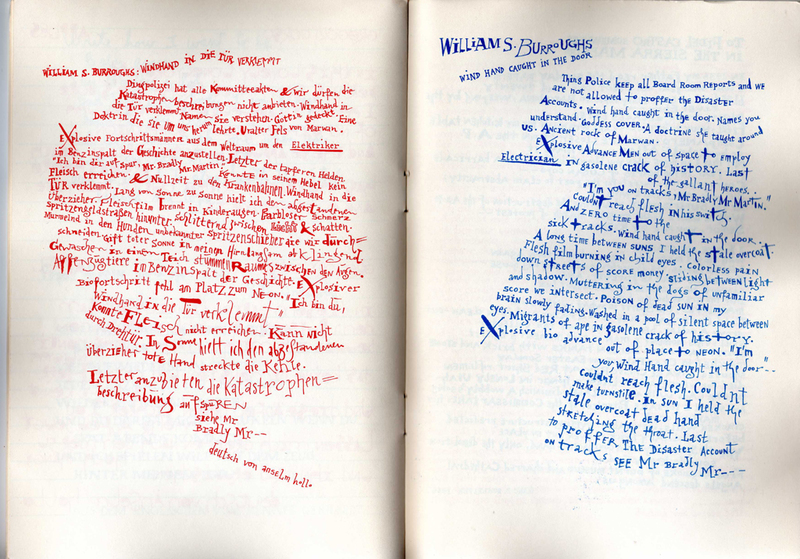 fascinating stuff – i wonder, did Bill have any say in the typography? 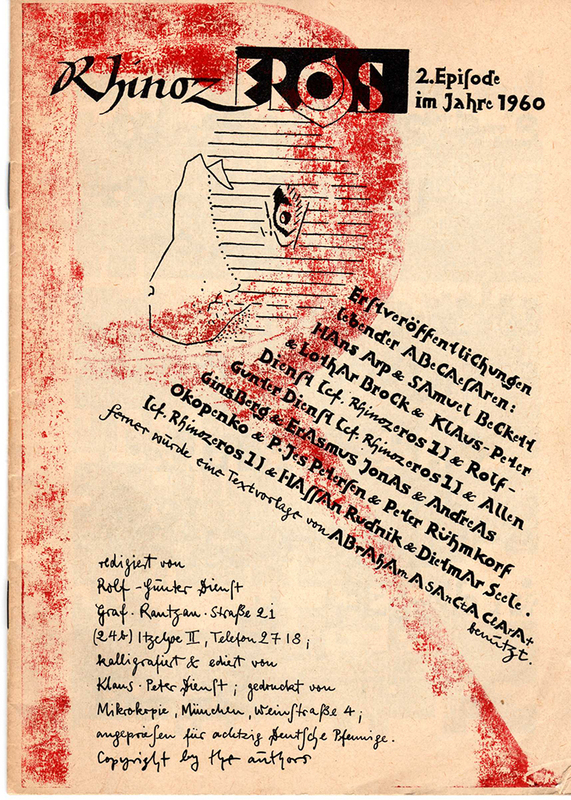 I happen to have a book by Klaus-Peter Dienst, Called Kalligraphische textkomposition. It is #252 out of 500 . My father, Carl Regehr, was a member of the original Chicago 27 graphic designers in Chicago, and this is from his collection of type books. The date on the book is 1962. If you would like to see photographs of the book, I would be happy to send them by email to you. excellent report and presentation. i’d never heard of rhinozeros. that corso embraced the idea that we are here to go doesn’t surprise me, and i’ll bet he had a great german girlfriend or two along the way. Apologies if this seems a bit of a skewed way to do this, but Jana, I would love to see those Klaus-Peter Dienst photographs of the book you have. 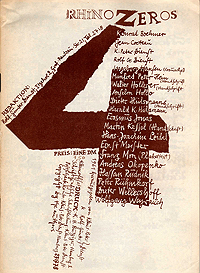 I found some work of his in a catalogue from a Stedelijk Museum Amsterdam exhibtion from 1962 and would like to find out more about his work. Rolf-Gunter, not with th. I have his paperback on Pop somewhere, but had never heard of Rhinozeros. This is very interesting information. I was a student of Gregory’s, but knew little about this dimension of his life.